After completing her fifth tour of duty in a war zone, Sergeant First Class Avery Grant is happy to be stateside again with a new assignment at Fort Gordon in Augusta, Georgia. But first, Avi is looking forward to thirty days in Tallgrass, Oklahoma, a town which holds a special place in her memories from childhood summers spent there with her grandparents who owned the flower shop that now belongs to Avi’s parents. As eager as she is to see her parents, Avi is pleased to have a week on her own while her parents are on a cruise. She needs time alone, and she needs to pay a visit to Patricia Sanderson, widow of Col. George Sanderson, Avi’s mentor and her commanding officer at the time of his death in Afghanistan. A friend of her father’s since their West Point days, George Sanderson inspired a ten-year-old Avi to aim for a military career, and he served as her model of all a soldier should be. Her esteem and affection for him and for Patricia are great. Ben Noble’s image of George Sanderson is quite different from Avi’s. He remembers him only as the man for whom his mother left her husband and three children. It was not until after George’s death, and at the urging of his mother’s neighbor Lucy Hart, another military widow, that Ben ended his estrangement from his mother. Even now, although he visits Patricia in Tallgrass when he has free time from his schedule as a successful orthopedic surgeon, he still has not fully forgiven her for leaving her husband and three children to marry George, a blow from which Ben’s beloved father never recovered. Despite their very different views of George Sanderson, Ben and Avi fall for one another quickly. The chemistry is strong, and they genuinely enjoy one another. They begin a relationship with each reminding himself/herself that their circumstances mean that their relationship comes with an expiration date. Avi will soon leave for her new assignment in Georgia, and she is wholly committed to the life of a career soldier and another twelve years in military service. Ben’s thriving practice and his loyalty to his two younger sisters for whom he felt a deep responsibility after their mother’s departure mean that he is deeply rooted in Oklahoma. Happy-for-a-while seems the best for which they can hope, but their hearts ignore reason. I am a long-time fan of Pappano’s fiction. Her Bethlehem series holds a spot in my bookcase that is reserved for keepers I reread often. 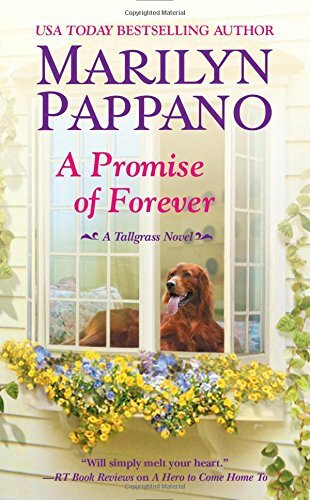 I think her Tallgrass novels are among her best work, and A Promise of Forever is an excellent addition to the series. Ben and Avi are good, although imperfect, people who have endured pain and heartbreak, and it is easy to root for them to find their HEA. Their story offers the poignancy, warmth, and believably complex characters that have become hallmarks of this series. The gender role reversal with a hero with strong ties to place and family and a heroine pledged to military service offers a rare take on military romance. Secondary characters add interest to the tale. Patricia is a still grieving widow. She lives with regrets, but she doesn’t regret a day that she spent with George. Avi’s parents present a portrait of a long, happy marriage. Additional secondary characters include other members of the Tuesday Night Margarita Club, otherwise known as The Fort Murphy Widow’s Club. Particularly prominent is the delightful Lucy Hart, who is still struggling with her weight issues and hoping to find a second love with whom she can find the magic she knew with her Mike. A Promise of Forever can be read as a standalone, but it will be more engaging and nuanced read as part of the series. If you like military romance or small-town romance, I think you will enjoy this book as much as I did. I have already pre-ordered A Chance of a Lifetime (December 22), the next book in the series and the story of Benita Ford, another Margarita Club widow. And I am hoping that in 2016 Lucy will find her second chance at magic. I highly recommend the full series. This one sounds intriguing. I'll have to check out the series. It's unusual, Nikki, in that it focuses on military widows. It is one of the best portrayals of different ways people handle grief that I've come across in fiction. I think it is an exceptional series. I always enjoy reading your reviews, Janga. I agree on this series; it is one of the best portrayals of the way people handle grief. I find I have to be in the right mood to read a Tallgrass novel, maybe needing a little lift after a tough week. One of the aspects I really enjoy is the simple expressions of faith throughout the books even though they are not sweet or inspirational romances. I'll be adding A Promise of Forever to the TBR file and will also be waiting for Lucy's story. Thanks, LauraL. I'm glad to hear from someone who shares my affection for the series. I think it is a series that deserves more readers. I love this series and finished this book last week.